While the United States population has become less religious in recent years, the overwhelming majority of Americans still identify as Protestant or Catholic. We were interested in the portion of the population (about 8 percent) that follows a religious tradition other than Catholic or Protestant Christianity. Delving into the available data, we determined the second most-practiced religious tradition in each state and created today’s map. Our map uses data from two main sources: the Pew Research Center’s 2014 U.S. Religious Landscape Study and the Public Religion Research Institute’s (PRRI) 2014 American Values Atlas. Both these studies involved large-scale telephone surveys that asked people about their religious beliefs and affiliations. Our map was created primarily by comparing these two studies. But even though they were conducted around the same time and used similar methodologies, the Pew and PRRI surveys don’t always agree. Additionally, both studies round their numbers to full (or sometimes half) percentage points, which means sometimes there was a tie for the second-largest religious tradition in a state. When the two surveys disagreed, or when multiple religions tied, we looked to other sources for clarification. The Church of Jesus Christ of Latter-day Saints publishes state-level membership numbers on its website, and each year the Berman Jewish DataBank releases a report on the Jewish population of the United States. When Mormonism and Judaism were in contention for most-practiced (non-Catholic, non-Protestant) religion in a state, we used these population estimates to identify which tradition came out on top. Unfortunately, similar data wasn’t available for other groups. We couldn’t find reliable state-level population estimates for Buddhists or Hindus, and the most recent population estimates for Jehovah’s Witnesses come from data collected in 2010. 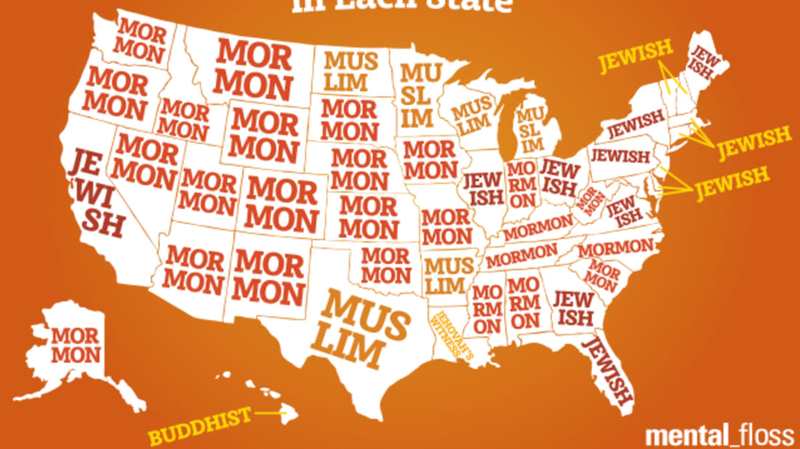 Current estimates were also not available for Muslims in most states, and the available estimates vary widely (though we did take those numbers into consideration for Iowa). Another map on this same topic made the rounds in 2014, using data from the 2010 U.S. Religion Census, which was conducted by the Association of Statisticians of American Religious Bodies (ASARB). That study tallied the number of people associated with specific religious congregations across the country. To get this information, the ASARB contacted thousands of churches, temples, mosques, and other religious congregations and asked about the people who regularly attend their services. This method is very different from the self-identification surveys we relied on for our new map, and resulted in different conclusions. The ASARB method counts the amount of people who regularly attend religious services, so it makes sense for measuring adherents to Mormonism, for example, in which membership in a religious congregation is highly valued, but it's hard to gauge the size of Buddhist populations, because Buddhism doesn’t emphasize participation in a faith community. Today’s map also looks different from the 2014 map because we categorized Mormonism and Jehovah’s Witnesses separately from Catholic and Protestant Christianity.